Happy 2013! Bringing in the New Year with a baby Kudu, a baby Wallaby & a baby Duiker! Still hoping to get a shot of the baby Duiker, but it prefers to stay in the barn, out of sight. Better luck in February! February brings in Lunar New Year, and it's "Year of the Snake!". Martha, the Tiger gets to play with a snake full of goodies and she really enjoys her enrichment! The little Wallaby Joey is venturing out to nibble on grass now. March & April brings Jillian out to play. She's a baby Sumatran Tiger. Many of the animals had fun in March with their Easter enrichment, made especially for them. By May, the newly arrived San Clemente Island Goats gave birth to 4 kids in the Children's Zoo. They are full of energy and run around everywhere! There's also a new baby in the Chacoan Peccary yard, so stop by and take a look! The Magellanic Penguins are beginning to hatch, and I hope to have some photos of them next month. June-July: The babies are growing fast! The San Clemente Island Goats are running around the Children's Zoo now, and the Penguin chicks have graduated from Fish School and returned to Penguin Island. The little Peccary pup likes racing around the adults now, and is nibbling leaves also. Jillian, the Sumatran Tiger cub is getting so big, but just as cute as ever! Ulu, the Polar Bear is now in a double exhibit - one with soil and plants, and the other with a pool. Stop by and see the new Red-Fronted Lemur on exhibit - there's a male and a female. They blend in with the trees, so you'll have to look hard! August - September: The new Komodo Dragon on the block is "Big Daddy Bahasa". He's just a little guy right now, about 4 feet long, but he'll grow to be a lot bigger than that in the future! The baby penguins are settling in with the flock, and Jillian, the Sumatran Tiger cub, has grown by leaps and bounds! October: The new Elinor Friend playground is just about finished, and it looks spectacular! The end of October brought 6 little Peccary pups! "Boo at the Zoo" was lots of fun, and many of the animals - big and small - received Halloween theme treats! Baby Gorilla girl is doing really well, and is now crawling around, and trying new things to eat. November: The new Elinor Friend Playground is open, and it's lots of FUN! There are several new birds across from the Chimpanzees, and they are beautiful! Baby Girl Gorilla is doing well, and the Chacoan Peccary pups are getting big! December: The Zoo Lights event was so pretty this year. I hope you had a chance to come out and enjoy the SFZoo at night! We have a new male Amur Tiger, and he's a beauty! The little Bennett's Wallaby has a baby in her pouch, (wiggle, wiggle, wiggle! ), and I hope to see it pop its head out of the pouch sometime in January! 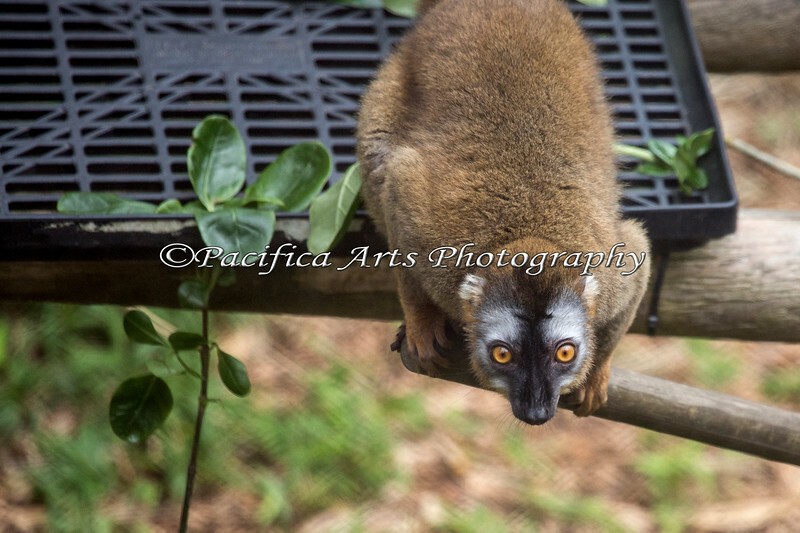 Red Fronted Lemur, getting ready to leap.